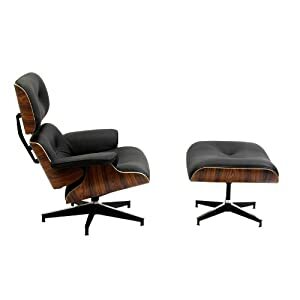 The Lounge Chair is widely considered one of the most significant designs of the 20th century. It was designed to create a club chair using the molded plywood technology that was pioneered in the '40s. The vision was a chair with the "warm, receptive look of a well-used first baseman's mitt." The result has become the consummate lounge set, timelessly blending old-fashioned comfort and visionary modernism. Pairing soft, inviting leather with the sleek form of molded plywood, the seat is balanced on a five-star, die-cast steel base.